Yesterday, our friends Dawna and Jim and Beth and John came over for brunch, one of our favorite meals to host. Neither Clif nor I are morning people, so inviting people over for an early breakfast is not, ahem, our thing. But brunch can be started late morning, even noon, if you feel like it, and we love all the brunchy food—pancakes, waffles, home fries, egg dishes. We just don’t want to prepare them first thing. The day of the brunch, I put together the chili eggs, a baked dish with plenty of cheese and, of course, green chilis. I am also Captain Home Fries, and for this brunch I had three frying pans going—five pounds of potatoes—while the chili eggs baked. Truly, I felt like a maestro as I presided over the sizzling home fries. Clif whipped up his delectable waffles, and we gathered around the dining room table as he made fresh hot waffles, one at time. He passed the plate around, and sections were taken. At first the dish came back empty, but as Clif continued making waffles, we could no longer keep up with waffle consumption, and the pile grew. The cherry on the sundae was Beth’s blueberry cake, so moist, so light, so good. After a meal like that, stretching on for hours, Clif and I didn’t eat much of anything else for the rest of the day. The talk around the table ranged from politics—the Iowa primaries are coming right up—to books, to movies, and, of course, to food. I mentioned that with Shannon and Mike moving to the South, one of the things I really missed were the simple celebrations—birthdays, anniversaries, Mother’s Day—that we shared. I told of the fish tacos we made for Shannon’s birthday last year and of the chocolate cupcakes with peppermint whipped cream that Shannon always made me for Mother’s Day. Such a sweet story in so many ways—the love the granddaughters feel for their grandfather, the helping with the cupcakes, and the pleasure they take in celebrating Jim’s birthday. The granddaughters are young, and it says a lot that Jim’s birthday, rather than their own birthdays, is the favourite celebration. I have no doubt that when those girls grow up, they will continue the tradition of food and merriment in celebration of birthdays and other special events. You’ll have to do a post just on ‘chilli eggs’ 🙂 They sound exotic to those of us away from your part of the world. What a delicious and interesting brunch and it’s a good story. Mary, your wish is my command. I’ll be posting the recipe today. 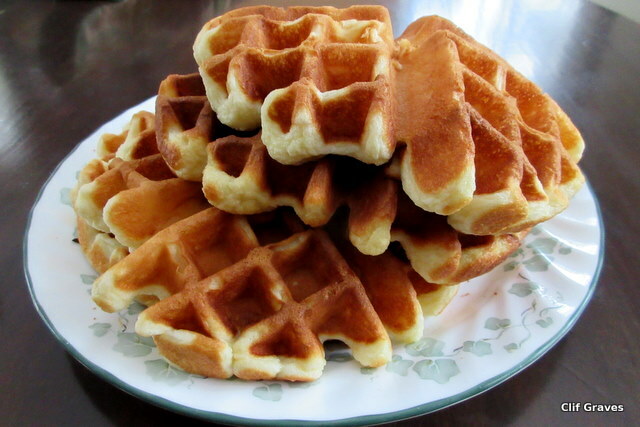 And I miss Dad’s waffles too – no one makes them better!! Yum! Sounds like a fun brunch! Shannon, a very nice brunch. And Dad does make delicious waffles. Judy, today I will be posting the chili egg recipe, and I’ll also include instructions for making home fries. Very, very simple, as long as you start frying with cold potatoes. I wouldn’t mind dropping in on that brunch. The chili eggs sound fantastic. Have you ever tried Spanish tortilla – a kind of potato omelette. Delicious, and a great brunchy food. Jason, if you and Judy ever come visit our state capital, there will be places at the table (or patio!) for you. I found you through your comment on the New England Gardens blog after I commented about electricity staying on. (such is blog life!) I enjoyed your waffle blog because my husband is a big waffletier if that is a word and I am in a sourdough phase which means I have a lot and put it in everything. Last week it went into waffles and was it good. I also am replying to ask if the dog in your picture is a sheltie. I found myself getting a little weak in the knees looking at it because we had one for 15 1/2 tremendous years. She died about 7 years ago but I can still feel her presence when I want. Whenever I am lucky enough to see someone walking one I veer over, say we had one and can I pet yours. It makes my whole day! Even if yours isn’t it is a very sweet picture. Welcome, Betsy! So wonderful making connections through other people’s blogs. Glad your husband is able to have his waffle craving fulfilled. Yes, Liam is a Sheltie, albeit an oversized one. You have a good eye! What a gift to have a wonderful dog for 15 1/2 years, and how we miss them when they pass. Ours was larger than they seem to breed them now. A couple pounds overweight at 32#. Our son has property and a trailer in Freedom which may be up your way. He is a journalist in Boston but goes up frequently and we go a couple times a year in warmer weather. Pretty area. Freedom is not too far from where we live. An hour or less, I think.